Google Chrome finally came to iOS. Despite months of speculation, many doubted Google would ever bring its terrific Chrome browser to iOS. But the search giant has put an end to the rumors by finally releasing it, and it’s kicking off this week’s must-have apps roundup. We also have a new weather app for those who like to keep it simple, arguably the best Google Analytics client for iOS, and more. The chances are, most of you downloaded Google Chrome for iOS the day it was released. But for those who didn’t, here’s why you should. First, if you use Chrome on your Mac or PC, you should be using it on your iPhone, iPad, and iPod touch as well. It allows you to sync your bookmarks and even your tabs across all of your devices, allowing you to walk away from a webpage on your computer and open it up on your iPhone with just a couple taps. Simply sign in with your Google account, and everything will be waiting for you — including your saved passwords. As you’d expect, Chrome also supports multiple tabs, and you can quickly flick through them like a handful of playing cards to find the page you’re looking for. When you want to close a tab, simply slide it away. When you want to look at a website that you want no one else to know about, you can do so in Chrome’s “Incognito” mode. The great thing about this is, just like Chrome on your desktop, you can run regular tabs and Incognito tabs side by side. Unlike mobile Safari, which requires you to switch between regular browsing and private browsing within the Settings app. Chrome also allows you to open pages in desktop mode when the mobile view just doesn’t cut it for you. It boasts a clean and simple user interface, like its desktop counterpart, and it’s super speedy. There’s no good reason why you shouldn’t be giving Chrome for iOS a try. This is summer in England. There are more weather apps on iOS than you can shake a stick at, and I’ve written about many of them. But Weather Neue is a little different to the rest, because it’s as basic as it can be. There are no fancy graphics, lengthy settings menus, or even tons of features. And to some of you, that may be a problem. But for those who just want to know what the weather is in a certain city — without tackling a confusing weather app — Weather Neue is perfect. It gives you the current weather conditions including temperature, wind speed and direction, and a very brief description of the weather for the next three days, including an icon to describe its condition, plus high and low temperatures. And that’s about it. There are four different themes, which you can see above, but all they do is change the background and text color. If you like highly detailed weather forecasts broken down by the hour, Weather Neue is not for you. But if you want to know what the weather’s going to be like today and nothing else, it couldn’t be easier than with Weather Neue. 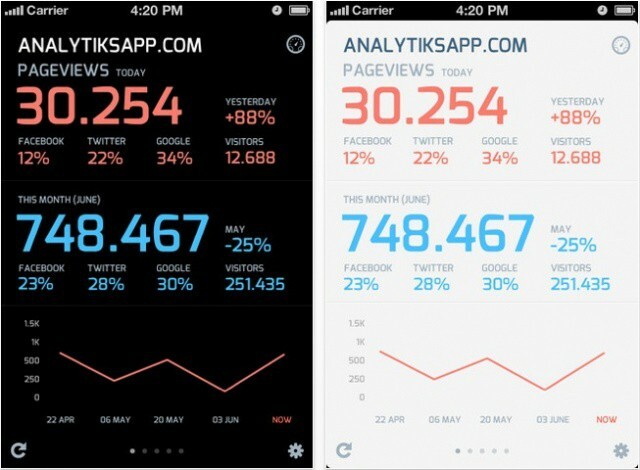 Analytics is arguably the best way to monitor your Google Analytics traffic on iOS, and it promises to deliver your data “with meaningful and friendly messages” that “everybody understands.” This week Analytiks got a major 2.0 update, which makes this app even more of a must-have. It introduces a sleep new design, the ability to view visitor stats, different themes, and faster performance. You can use it to monitor your daily and monthly pageviews, where your traffic is coming from and how each day compares to the last, your key demographics and which web browser and operating system they’re using, and lots more. Analytiks is very well-designed and it provides all the data you want to see on the go in a very friendly interface. And at just $0.99, it’s a bargain. Over: text+photos makes it incredibly easy to add text to your photographs before you share them with your friends. Whether you want your images to be funny, informative, or inspirational, Over gives you all the features you need and makes it quick and simple to apply them. It offers a nice selection of gorgeous fonts, and you can customize its size and even its tinting to ensure it works perfectly on your image. Rearranging your text is as easy as dragging it around. Once you’ve finished creating, you can share your finished article on Twitter, Tumblr, Facebook, Instagram, or via email. 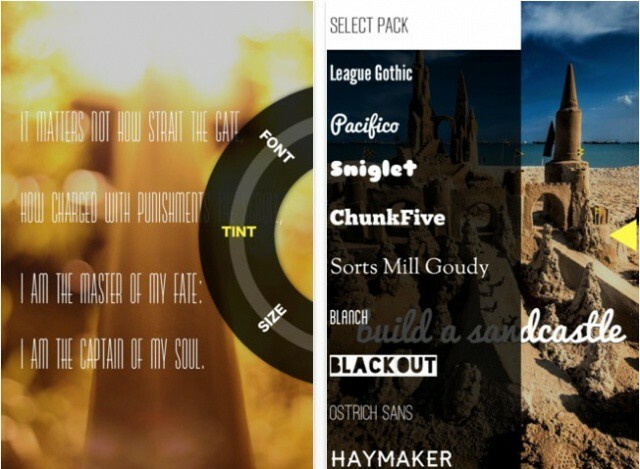 So that concludes our list of this week’s must-have iOS apps. If you’ve picked up something that you think we should have included, be sure to let us know about it in the comments.